While the Hunley rested on the floor of the ocean for over a century, salt water slowly penetrated her iron skin. The salts weakened the structure and rendered the once strong iron submarine vulnerable to air exposure on land. Unprotected in open air, her hull would rapidly rust and collapse. Finding a way to reverse the corrosion damage has been a major challenge for conservators. 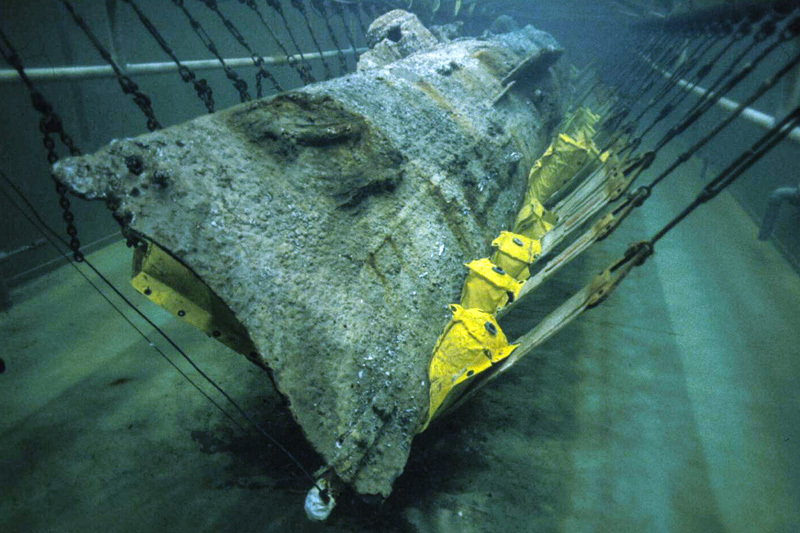 The Hunley is a unique, complex artifact, therefore there was no “textbook” approach to follow for the submarine’s conservation. Additionally, the excavation of the crew compartment produced a large array of fascinating artifacts from the 19th century, some made of cloth, glass, silver, and leather. Each of these elements required different conservation techniques and specific, specialized treatment. Working with Clemson University, the conservation team has managed to overcome these many challenges. It has been a time-consuming process, but worth the wait as the team is saving our nation’s rich maritime history. Today, hundreds of personal artifacts from the crew have already been conserved and a plan is well-underway to save the submarine itself. To reach this point was a decade-long journey that began on August 8th, 2000. Photo by Christopher F. Amer. Courtesy of SCIAA. After the Hunley was recovered in 2000, she was placed in a 75,000-gallon tank designed to protect the world’s first successful combat submarine until a full conservation treatment could be conducted. The Hunley needed this protection; otherwise, she would rapidly begin to rust and deteriorate. This interim solution bought scientists the time they needed to excavate and develop a plan to ensure the submarine’s survival. When excavation began in 2001, the conservation team quickly discovered they faced a daunting task. The Hunley is a unique artifact, and very few maritime objects with such an intricate and complex construction have ever been conserved. Years of research, testing, and planning went into developing the Hunley Conservation Plan, which was submitted to and approved by the United States Navy. “The magnitude of our task was enormous. We worked with experts world-wide to make sure the plan would be appropriate for an artifact as historically important as the Hunley,” according to conservator Paul Mardikian, one of the key architects of the plan. The 171-page document outlines an innovative process for conserving the Hunley and includes preliminary findings on ground-breaking research that could revolutionize the field of maritime conservation. The plan was divided into three major phases, two of which have already been completed. The Hunley at rest in her custom slings. When the Hunley was found, she was resting at a 45-degree angle with her starboard side on the seabed. During the process of recovery, the underneath of the submarine was systematically excavated and slings were installed beneath the submarine one by one to safely lift her from the ocean floor. She remained resting in this cradle of slings at a 45-degree angle for many years, which meant the entire right under-side of the submarine was almost impossible to access. To move the Hunley upright, an engineering study and strength evaluation of the structure was completed. During excavation, four semi-hemispherical hull plates were taken off to allow access to the crew compartment. This led to the removal of approximately 11 tons of sediment that encased the Hunley crew’s remains and personal belongings. This work, though necessary, impacted the submarine’s structural integrity. 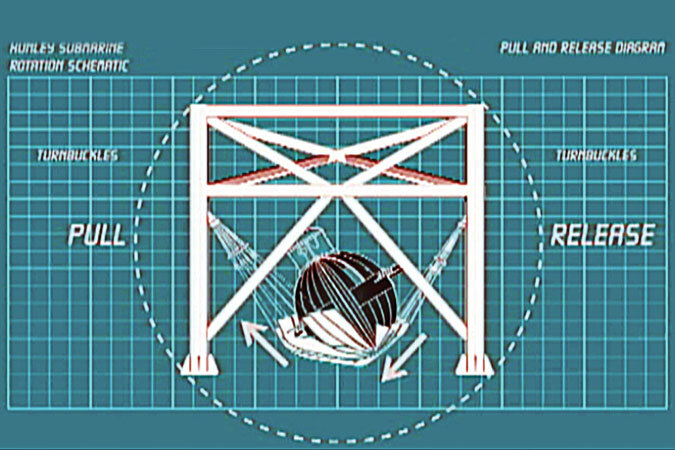 The engineering study analyzed the metal and the findings were used to determine how to remove the Hunley from its support slings without damaging the submarine. The rotation project was safely completed over 3 days in June 2011 and was a pivotal moment in the Hunley Project. Moving the Hunley to an upright position gave scientists the access they needed to remove the concretion that coated the outside of the vessel. With the rotation of the submarine completed, the next step could begin. Until recently, the Hunley was completely encased in concretion, an encrusted layer of sand, sediment and shells that built up slowly over time while she was lost at sea. In 2014, Clemson University conservators began chiseling away this concretion, allowing the submarine to be fully visible. During this year long process, they carefully removed approximately 1,200 pounds of concretion, roughly the same weight as a grand piano. It was a painstaking task with one slip-of-the-hand potentially damaging this irreplaceable artifact. They used small hand tools, drills, and chisels to break away the concretion, which in some places is harder than the corroded iron it covers. 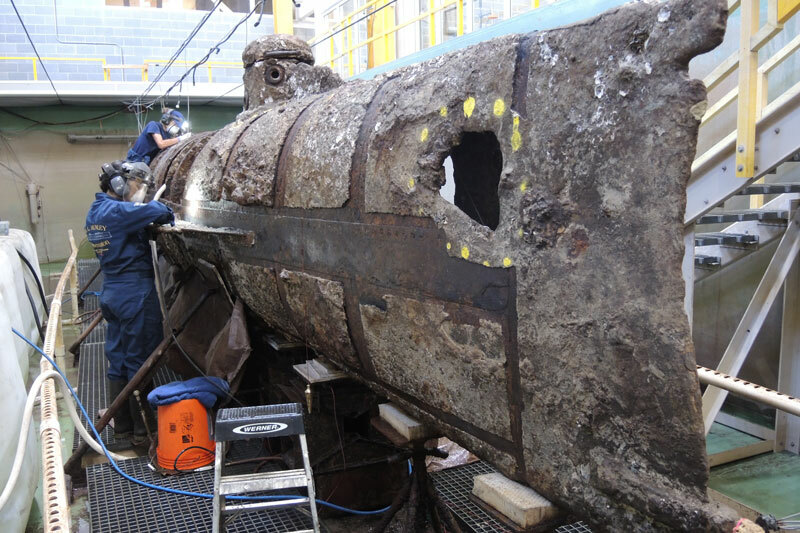 Removing the concretion is a necessary step in successfully conserving the Hunley, and those working to solve the mystery of her disappearance are hopeful it will also yield valuable new clues. It has been very difficult to conduct their investigation when they have not been able to view and study large portions of the submarine since it has been covered with this substance. The concretion could very possibly be masking critical data. 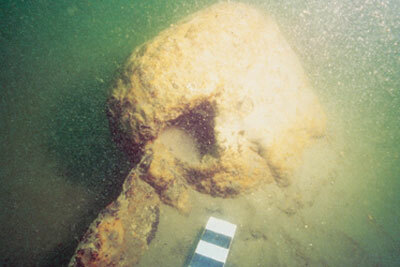 For example, historical records indicate the Hunley was spotted by the enemy and fired upon shortly before her attack. During the removal process, scientists could find clues and evidence that will shed light as to why the submarine vanished. With the exterior now completely exposed, conservators are now removing the material covering the inside of the crew compartment. With roughly a four-foot diameter, the cramped space within the Hunley will present a new set of challenges. “It is a daunting task to do this slow, detailed work in such a small space. I can’t even imagine how intimidating it must have been for the men who actually cranked the submarine,” said Clemson University Conservator and Collections Manager, Johanna Rivera. Still underway, this phase is the most time consuming and important: removing the salts that threaten the Hunley’s existence. The process of cleansing the salts (or chlorides) embedded in the iron hull will be attempted in a matter of years to undo the harm the ocean took over a century to cause. To do this, the vessel is being submersed in a chemical solution designed to soak the salts out. 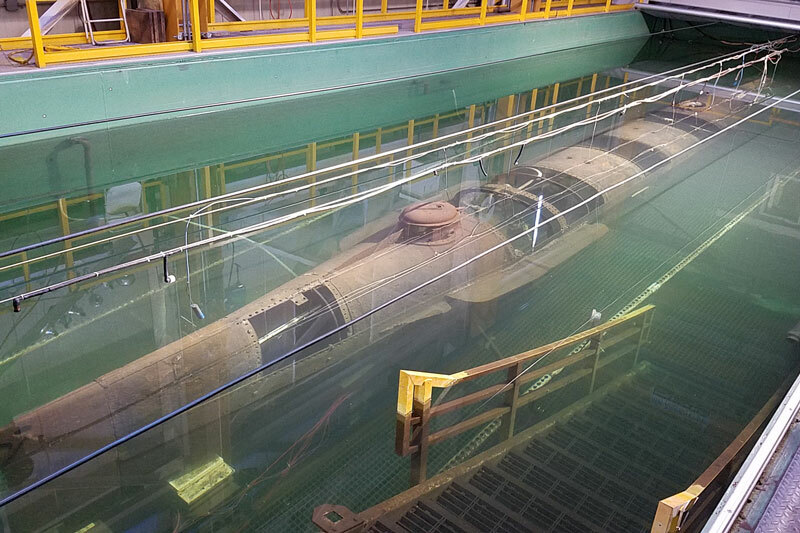 In May, 2014, the 75,000-gallon holding tank the Hunley rests in was filled for the first time with a bath of Sodium Hydroxide. This was the first of many long soaks and the goal of this initial bath was mainly to loosen up the rock-like layer of concretion. Scientists are carefully removing this layer of debris because it inhibits the effectiveness of the conservation treatment from leaching out the salts. There are often higher levels of corrosion along the seams holding a structure together. Because of this tendency, sometimes artifacts are dismantled for conservation. This approach would be a tragedy in the Hunley’s case. “We worked hard to develop a plan that would allow us to preserve the original fabric of the submarine as much as possible. The Hunley’s structural integrity is important to us, and important to history.” Mardikian said. During treatment, the Hunley will be constantly monitored and once the chemical bath is saturated with the salts it has leached from the submarine, it will be drained from the tank, neutralized, and replaced with a fresh solution. This process, which is estimated to take approximately 5-7 years, will be repeated until the level of salt in the iron is low enough to allow the Hunley to be rescued from its delicate and dangerous state. The Hunley’s final journey will be to a permanent display facility where future generations can learn from her technology and innovation. Plans are underway to build a world-class maritime museum, focusing on the American 19th century, which will house the Hunley, Union and Confederate artifacts, as well as other important naval collections. Iron artifacts from the sea in particular are susceptible to rapid deterioration when exposed to an oxygen rich environment like air. Chlorides from the seawater penetrate the iron on the molecular level. When in solution, these chlorides present no real problem. However, when exposed to air, they slowly dry in crystal form. As the crystals grow, the surface of the metal will expand and flake away, eventually reducing the artifact to a pile of iron oxide dust. Similarly, organic materials will literally collapse upon drying in a matter of days. These reactions are due to a sudden break in the equilibrium reached by the artifact after years of submersion. The main goals of conservation, therefore, are to provide archaeologists with the proper tools and techniques to handle, store, stabilize, and study the recovered artifacts.